G’day, forex mates! If you’re looking for a potential catalyst for the Aussie, then heads up because Australia’s jobs report will be released on Thursday at 1:30 am GMT. Australia’s labor market had more misses than hits in March. For starters, only a net of 4,900 workers had found jobs for the month, which was waaaay weaker than the 20,300 additions that analysts had expected. A closer look didn’t help since the 24,800 increase in part-time jobs didn’t compensate much for the 19,000 full-time jobs lost. The only silver lining was the previous month’s unemployment rate, which was revised lower to 5.5%. But the labor force participation rate was also knocked lower from 65.6% to 65.5%, which suggests that the decrease in jobless rate was partly due to job-seekers giving up rather than an overall increase in jobs created. The cherry on top for the doves was February’s numbers being adjusted from +17,500 to -6,300, which effectively broke the 16-month streak of net job gains for Australia. Yikes! Luckily for Aussie bulls, traders were too busy pricing in an uneventful meeting between Trump and Japan’s Shinzo Abe, as well as a lack of fresh geopolitical and trade-related concerns for the U.S.
Do leading indicators support these expectations? Australian Industry Group’s (AIG) performance of manufacturing index (PMI) slipped 4.8 points to 58.3 in April after hitting a seasonally adjusted record high in March. But although the employment component also fell by 3.9 points, its 56.1 reading is still higher than the 12-month average of 54.7. AIG’s performance of services index (PSI) didn’t fare much better with its 1.7-point decline to 55.2. The employment component was the best performing at +3.7 points, however, which is a good thing because service industries make up more than 61% of Australia’s GDP. AIG’s performance of construction index (PCI) completes AIG’s trio of reports and showed a 1.8-point decline in April. Fortunately, the employment component bucked the trend with its 3.8-point increase to 59.5. This marked the 12th consecutive month of expansion and the fastest increase since September 2014. Last but not the least is ANZ’s job ads report, which posted a 0.2% decline after already falling by 0.4% and 0.1% in February and March, respectively. Overall, the numbers do point to a stronger labor market for the month of April. Question is, will the improvements be enough to meet the 20,300 increase that analysts are expecting? Can past releases help us predict April’s job gains? As you can see below, analysts tend to underestimate April’s employment changes rather than overestimate them. However, April’s numbers also tend to print LOWER figures than March’s releases. Previous jobless rate releases aren’t helping much either. See, we’re only slightly more likely to see upside surprises in unemployment rates, while there’s no discernable pattern in comparing April’s rates to March’s releases. For now, available leading indicators do support the consensus that jobs growth picked up the pace in April. While historical trends aren’t very strong, they also point to possible upside surprises as analysts tend to be pessimistic in their April guesstimates for both employment change and the unemployment rate. But remember that we’re playing with probabilities here, so the risk for a downside surprise is still there. As for follow-through buying or selling, that usually depends on whether jobs growth was driven by full-time employment or not. 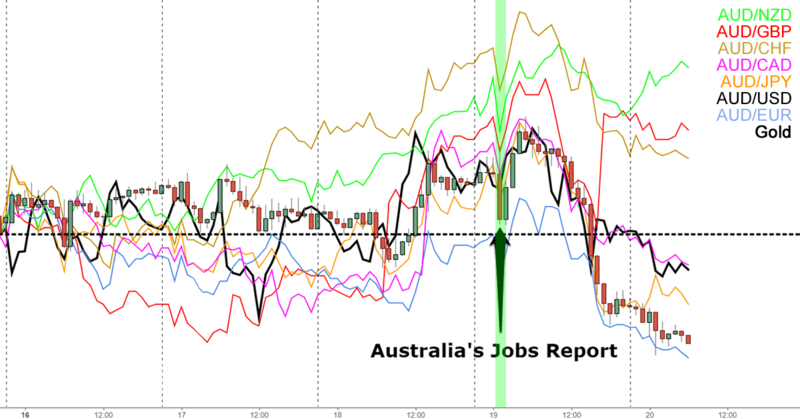 And since there are no other top-tier reports scheduled around Australia’s labor market release, it’s likely that the event could set the tone for Aussie’s price action for the rest of the day. Unless there are other economic themes at play, of course.